A new era of mobile music making on Android has arrived: iRig UA is the first digital effects processor and audio interface that lets you play your guitar, bass or other instrument on your Android device anytime and everywhere. It pairs with AmpliTube UA to deliver jawdropping and absolutely unmatched sonic performance with any smartphone or tablet with Android 4.2 or higher (and that supports host mode/USB OTG). Now you can enjoy high-quality real time effects processing on your Android device no matter whether it’s from Samsung, Sony, Motorola, LG, HTC, Xiaomi, Marshall or any other popular manufacturer. iRig UA sounds phenomenal and the reason for this is due to its built-in digital signal processor (DSP). This cutting-edge on-board processor is a first-of-it's-kind solution that solves the issue of latency on the Android platform by moving all processing to an external accessory. iRig UA's DSP has been designed to work with a companion app, AmpliTube UA. The app, which comes with iRig UA, is powered by the DSP. 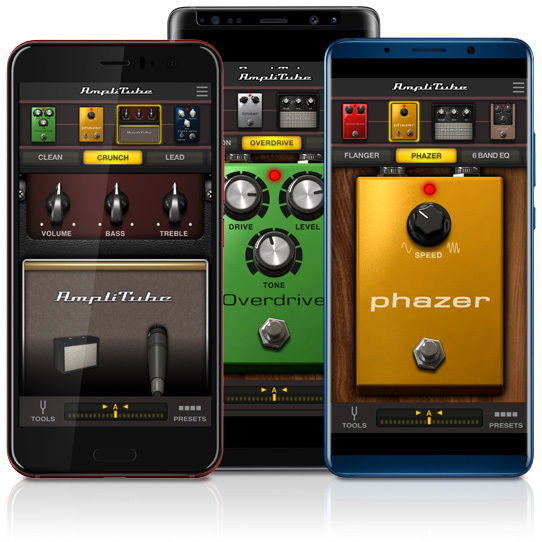 Like other versions of AmpliTube, it provides you with an amazing collection of virtual gear that you can use to create your own personal dream guitar or bass rig. A versatile system, iRig UA can also be used as a 24 bit digital recording audio interface when it's connected to either a Samsung Professional Audio-compatible or Android 5.0 device or a Mac or PC (requires USB to Micro-USB cable). With iRig UA and AmpliTube UA, the world's most popular mobile digital guitar interface and virtual guitar tone studio have both finally arrived on Android. Works on Mac or PC via optional USB to Micro-USB cable. iRig UA sounds great right out of the box. Just plug it into your Android device via the included OTG connector and you’ll be ready to go. It features a built-in 32-bit digital signal processor, a 24-bit A/D converter, a crystal clear low-noise preamp and an ultra-compact enclosure. With its premium specifications, it’s able to provide great sound, extreme portability and unprecedented cross-platform compatibility. And these features all come in handy when iRig UA is plugged into a Samsung Professional Audio compatible device (with Android 5.0). You can use it as a pro-quality digital audio interface with Samsung Soundcamp, a full-fledged DAW music studio app that lets musicians record and compose while on the go. iRig UA’s on-board digital signal processor works in conjunction with AmpliTube UA, a special version of IK’s powerful guitar and bass multi-effects processor designed specifically for use with iRig UA — because all of the processing is handled on iRig UA, and not on the Android device, it’s able to provide consistent near-zero latency performance (down to 2 ms round-trip total latency) that’s independent of the make and model of your connected smartphone or tablet. 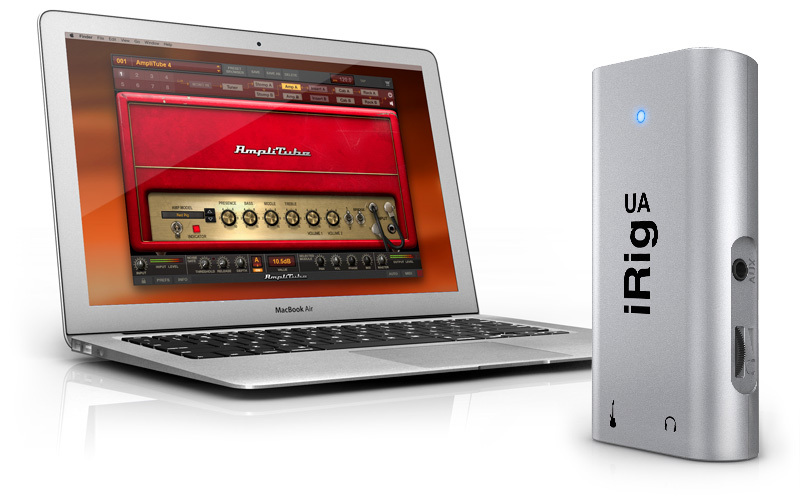 iRig UA also makes for an excellent portable audio interface for your Mac or PC. Just get a USB to Micro-USB cable and you'll be ready to play, process and record with the full power of your favorite music creation software. iRig UA works effortlessly with IK's own AmpliTube Custom Shop, a version of the legendary guitar and bass tone studio that includes a base library of 24 pieces of gear that can be expanded via the whole universe of brand name amps, stompboxes, cabinets and mics available for purchase via Gear Credits in the Custom Shop. And, if you register your iRig UA you'll get the bone-shatteringly brutal AmpliTube Metal collection, 25 Gear Credits and T-RackS Classic for free! iRig UA comes with AmpliTube UA, a full-featured version of the mobile guitar and bass tone studio that’s revolutionized the way musicians make music while on the go. AmpliTube UA features a generous and expandable library of meticulously crafted virtual versions of some of the most coveted gear in music history. You get 21 pieces of free gear right from the get go: there’s 9 high-quality stomp box effects, 5 amplifiers, 5 matching cabinets and 2 microphones. You'll love using these great sounding pieces of gear. They make it easy and fun to create virtual guitar or bass rigs comprised of an amplifier, 3 stompbox effects (which can be placed before or after the amplifier) and a cabinet with a positionable microphone. And while this is more than enough for you to get started, this collection can also be expanded thanks to an ever-growing selection of purchasable gear from such respected brands as Fender®, Orange®, Ampeg®, Soldano® and more. There’s also exclusive content available from IK’s immensely popular AmpliTube Slash and AmpliTube Jimi Hendrix™ collections. iRig UA offers truly superior sound quality that is noticably better than typical multi-effects pedals. Want to check out how good it is compared to the rest? We have processed the same guitar takes on iRig UA+AmpliTube UA and three digital modelling stomp-box in the same price range, matching style and tone to provide an unbiased sound test. A/B them for yourself, and you'll immediately hear the difference. Tone for tone, iRig UA and AmpliTube UA clearly sounds superior! The pairing of iRig UA and AmpliTube UA is perfect for when you need to practice while on the go. iRig UA features a 1/4” input for a guitar, bass or other line-level instrument, a micro-USB to OTG cable and an 1/8” headphone output with volume control. It also sports a 1/8” input that lets you connect your Android device or other external sound source so you can jam along to your favorite tunes while using the power of AmpliTube. On Android 5 and above you can play songs directly from your device (both from internal files or from Internet streaming services like Youtube, Spotify, etc..) directly to the iRig UA to play along your favourite tunes. On Android 4 you can do this by connecting the headphones output of your device to iRig UA’s AUX input. In the same way you can connect any audio source with 1/8” stereo output to iRig UA to play along with. iRig® UA and AmpliTube® are registered trademarks property of IK Multimedia Production Srl. Android™ is a trademark of Google Inc. All other product names and images, trademarks and artists names are the property of their respective owners, which are in no way associated or affiliated with IK Multimedia. Product names are used solely for the purpose of identifying the specific products that were studied during IK Multimedia’s sound model development and for describing certain types of tones produced with IK Multimedia’s digital modeling technology. Use of these names does not imply any cooperation or endorsement.